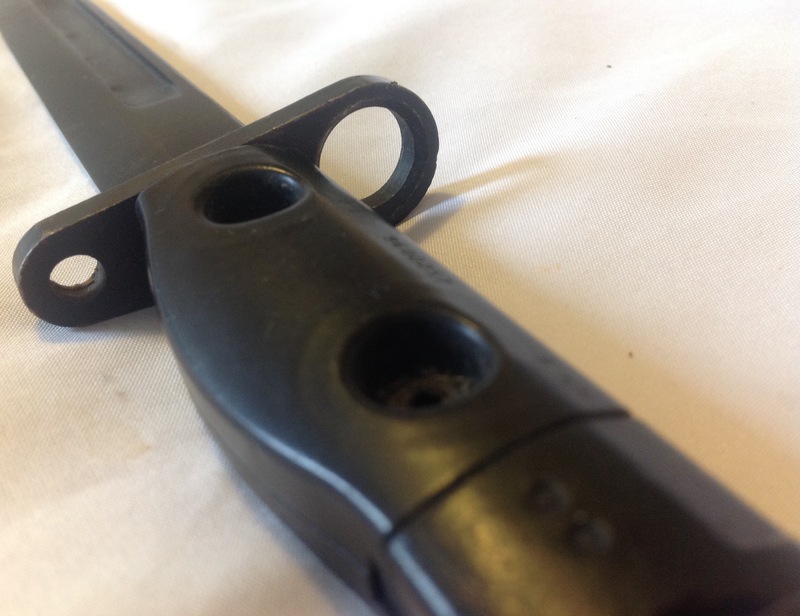 The SA80 bayonet we looked at a few weeks ago was used in combat with a black plastic scabbard that protected the blade and allowed it to be carried in the PLCE frog. When the SA80 rifle was introduced it was decided to offer two different scabbards for the bayonet. Frontline infantry would receive a version with built in saw, wire cutter and sharpening stone. Rear echelon troops received a simpler (and cheaper) scabbard without these features, the argument being that they would rarely need to use any of these features so it was safe to delete them. 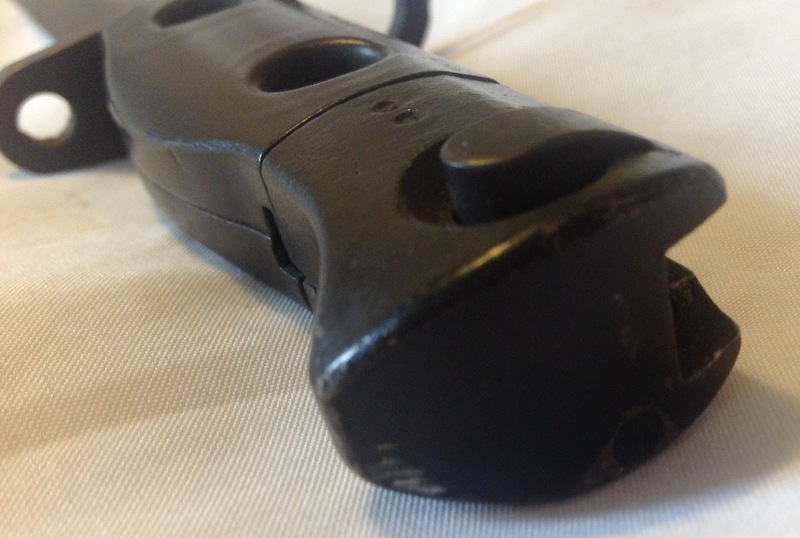 This simplified scabbard was made from a black Phenolite plastic: The design retained the fixing points to allow the extra features to be added if required: The differences between the two scabbards can be seen here: Other features remain the same however, so six raised grooves are provided near the throat to allow grip to remove the bayonet from the scabbard and to help add extra rigidity to this portion: A small plastic detent is used to keep the bayonet in the scabbard and prevent it from rattling around: The bayonet fits neatly inside, but will only fit in one way due to the design of the bayonet itself with its offset grip: In order to attach the scabbard to the PLCE frog, a female Fastex clip is moulded into the top of the scabbard: This marries up with a male Fastex clip sewn into the frog itself and keeps the scabbard firmly attached. This scabbard has clearly seen some service as an armourer’s rack number is painted on it in white: These simplified scabbards are much easier to find on the collectors’ market than the full combat versions which have not been released for resale in anywhere near the same amount and can easily make five times the price of their simpler counterparts. This entry was posted in Bayonet, British Army, Post WW2 on February 15, 2019 by hatchfive. When introduced the SA80 bayonet was quite a departure for the British Army. The new SA80 rifle was very different from anything that had been issued before, being shorter and lighter than was typical at the time. The bayonet which went with it was cast as a single piece and was designed to fit over the muzzle, the rifle firing through the grip. 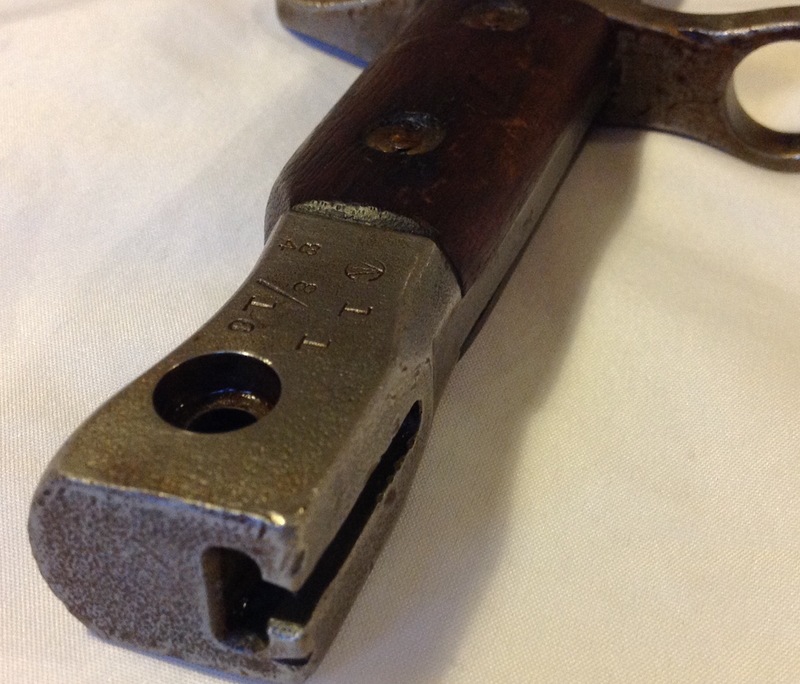 The bayonets were produced using the lost wax casting process and were produced as a single casting of six bayonets that were then separated and machined to the final design. When closing with the enemy at close quarters there may well be the occasion for hand to hand combat. The bayonet is issued specifically for this pur­pose. In most cases bayonets will be fixed in a final assault position just prior to fight­ing through an objective. Situations arise when it is not possible to shoot at the enemy. These could be, running out of ammunition, a stoppage during an assault, or the close proximity of a fellow soldier making a shot too dangerous. In these circumstances the use of the bayonet may be the only alternative. It can also have a demoralizing effect on the enemy. This entry was posted in Bayonet, British Army, Post WW2 on January 30, 2019 by hatchfive. In future manufacture, sword-bayonets of the above mentioned pattern ( LoC 14170 ) will have a hole drilled through the pommel to facilitate the removal of mud, dirt, &c., that may accumulate in the bottom of the mortice for the sword bar of the rifle nose-cap, and so prevent the bolt of the sword-bayonet shooting and locking the sword-bayonet on the rifle. This entry was posted in Bayonet, British Army, WW1 on December 14, 2017 by hatchfive. 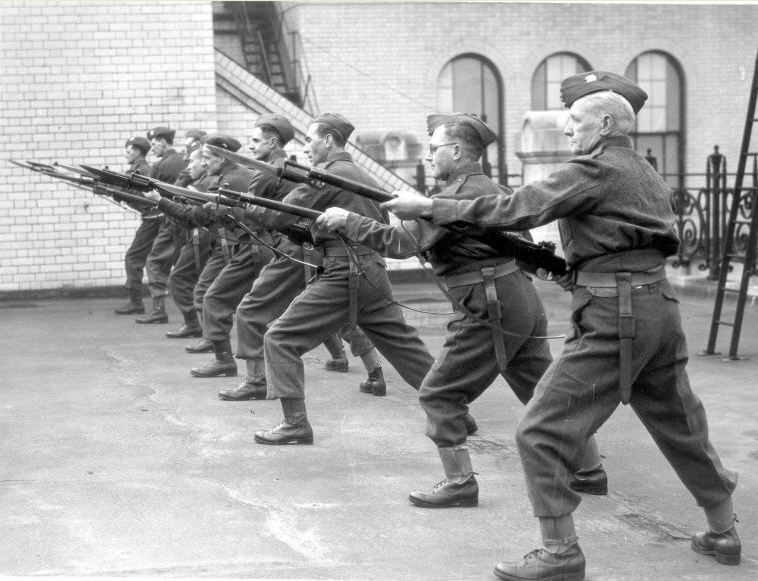 At the start of the First World War the Canadian Expeditionary Force was armed with an indigenously produced rifle, the Ross. This rifle was to be problematic and was eventually dropped in favour of the SMLE, however it remained in use for snipers and saw further service in WW2 with the British Home Guard. 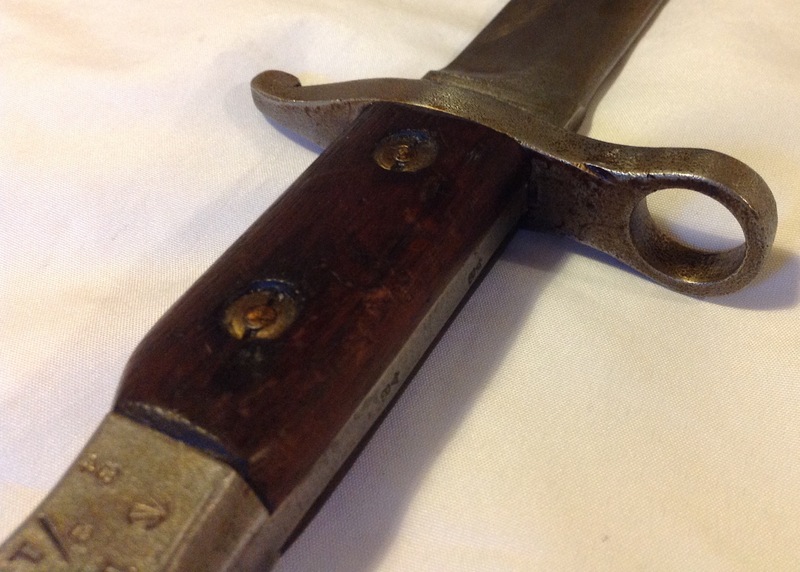 As with nearly all military rifles in service at the time it was supplied with a bayonet and tonight we are looking at the second model of bayonet issued for the rifle: This bayonet is particularly attractive, with a definite weight to it, it has a much shorter blade than that used on the SMLE, but the blade is thicker in cross section and feels sturdier: This shorter length made it a popular choice for a trench knife due to its handiness in the trenches of the First World War during raids and examples were modified by removing the muzzle ring and shortening them even more to tailor them for this use. 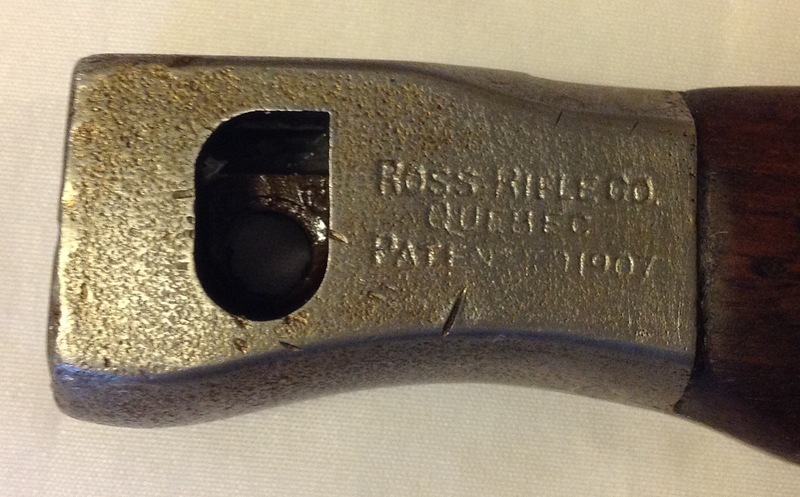 The pommel on the bayonet is marked ‘Ross Rifle Company, Quebec’ on one side: And has a number of marks on the opposite side including a /|\ within a ‘C’ Canadian acceptance mark, the date 08/16 (August 1916) and a ‘11’ indicating this is a MkII pattern bayonet first introduced in 1911: The Mk II differed from the earlier pattern which had an extended muzzle ring and a larger quinion , this was changed in the second pattern which provided the right sized muzzle ring and slimmed down the quinion: The bayonet was fitted to a ‘T’ shaped lug on the underside of the rifle’s barrel, with a channel provided for this to slide into. 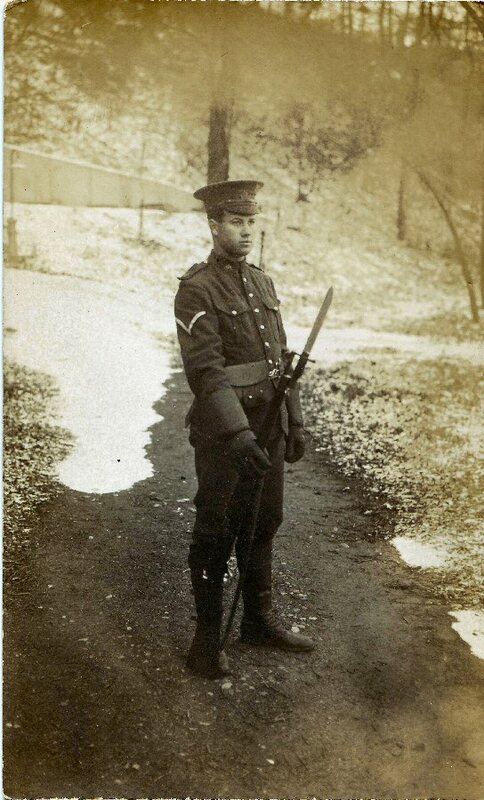 Sadly this bayonet is missing the sprung catch that would have allowed the bayonet to be secured, and removed from the rifle: Here we have a fine study of a young Canadian soldier in Canada holding his Ross rifle, complete with the bayonet attached: A generation later and we see the bayonet in use by the Home Guard in Britain, training with their Ross rifles: I have a number of bayonets in my collection now, and this one is competing with my No7 for the title of my favourite. It is a really nice piece to hold in your hand and beautifully made…now I just need a Ross to go with it! This entry was posted in Bayonet, Canada, WW1 on February 1, 2017 by hatchfive. I stuck my bayonet into the back of his arm, dug it right in because I had run out of ammunition. He spun wildly on the ground and my bayonet snapped. And as he spun, he was trying to get a Colt 45 out of an Army holster on his waist. So I had to stab him to death. I stabbed him and I stabbed him, again and again, in the mouth, in the face, in the guts, with a snapped bayonet. It was absolutely horrific [retrospectively — at the time he recalls crying out ‘Isn’t this fun?’ not long after this incident]. Stabbing a man to death is not a clean way to kill somebody, and what made it doubly horrific was that at one point he started screaming ‘Please. . .‘ in English to me. But if I had left him he could have ended up shooting me in the back. I took his rifle, moved on, shot a sniper, picked up his and moved on again. This entry was posted in Bayonet, British Army, Post WW2, Weapons on May 23, 2016 by hatchfive.